Tiny Broadwick’s portrait at the First in Flight Shrine, Kitty Hawk, North Carolina. She was called “Tiny,” weighing only three pounds when she was born in 1893, the seventh and last child of a poor farm family in Granville County, North Carolina. Georgia Ann Thompson was married at 12, a mother at 13, and a school dropout. After her husband was killed in an accident, she had to work 14-hour days in a cotton mill to support her daughter Verla. She seemed destined for a life of grinding, relentless poverty. But when she saw “The Broadwicks and their Famous French Aeronauts” at the 1907 North Carolina State Fair, something happened to Georgia Ann Thompson. She just had to become one of those daring people. They ascended to the sky in hot-air balloons, then thrilled spectators by jumping out of the basket and floating to earth with the aid of parachutes. Little Georgia asked show owner Charles Broadwick if she could travel with the group and become a part of the act. Broadwick was impressed by her good looks and spirit. He could see that pretty little girl, who stood all of four feet tall, would be a big hit. He agreed to hire her. Georgia’s mother let her go, but only if she’d leave the daughter at home in North Carolina and send back a portion of her salary to help. So Georgia Ann Thompson escaped the tobacco fields and cotton mills and set off for a new life and an honored place in the history of aviation. Broadwick trained her in the art of parachute jumping, and she became the sweetheart of carnival crowds all across the land. Broadwick also got her father’s consent to legally adopt Georgia, because it was unseemly for a young girl to be traveling the country with an older man. Her name became Tiny Broadwick. They called her The Doll Girl at the carnivals. She dressed in ruffled bloomers with pink bows on her arms, ribbons in her long curly hair, and a little bonnet on her head. But Tiny was anything but a demure princess. She was an utterly fearless daredevil, drawing large crowds wherever she went. Her first jump was in 1908. Newspaper stories described her as the most daring female aeronaut ever seen, chronicling the dangerous maneuvers she executed with apparently little or no fear. The Broadwicks traveled all over the country with their balloon act. But by 1912, that kind of performance was losing popularity. Times were changing, and heavier-than-air machines were rapidly getting better and better after the Wright Brothers’ pioneering work in the previous decade. Fortunately, a new opportunity arose for Tiny. Out in Los Angeles for the Dominguez Air Show, she met up with famed pilot Glenn Martin. He had seen her jump from a balloon, and he asked if she’d try parachuting from his airplane instead. Like Charles Broadwick, Glenn Martin saw how Tiny would attract spectators for his airplane shows. Tiny immediately agreed to work for Martin, whose aircraft company is still with us today as Martin Marietta. Charles Broadwick developed a parachute for her. It was made of silk and was packed into a knapsack attached to a canvas jacket with harness straps. A string was fastened to the plane’s fuselage and woven through the parachute’s canvas covering. When the wearer jumped from the plane, the cover tore away and the parachute filled with air. Tiny getting ready for her first jump from an airplane. On her first jump, Tiny was suspended from a trap seat behind the wing and outside the cockpit, with the parachute on a shelf above her. Martin took the plane up to two thousand feet, and then Tiny released a lever alongside the seat, allowing it to drop out from under her. She floated to earth and landed in Griffith Park in Los Angeles, making her the first woman to parachute from an airplane. After that first jump from Martin’s plane, Tiny was in great demand all over the country. She also became the first woman to parachute into a body of water. 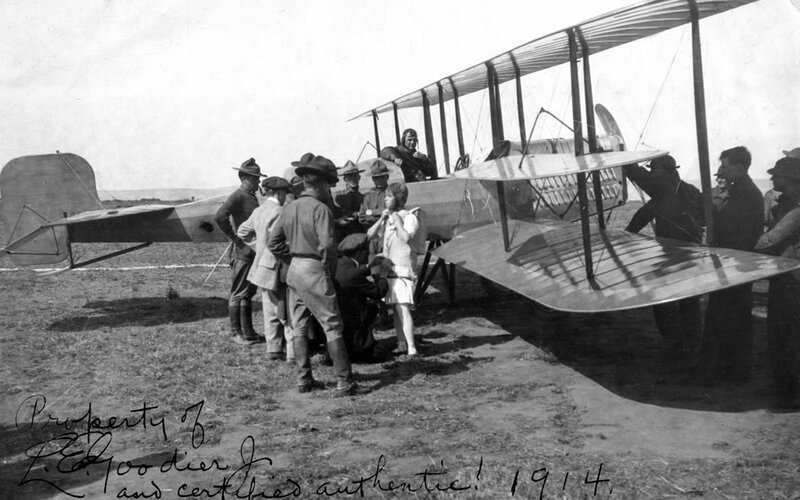 In 1914, representatives of the Army Air Corps visited Broadwick in San Diego and asked her to demonstrate a jump from a military plane. War was already raging in Europe. Many pilots of the corps had already perished, and more would surely follow if nothing was done to help them. Tiny made four jumps at San Diego’s North Island that day. The first three went smoothly, but on the fourth jump, her parachute’s line became tangled in the tail assembly of the plane. The wind whipped and her flipped her small body back and forth, and she could not get back into the plane. But Tiny Broadwick did not panic. Instead, she cut all but a short length of the line and plummeted away toward the ground. Then she pulled the line by hand, freeing the parachute to open by itself. Thus she demonstrated what would be known as the rip cord. Her quick thinking and cool under pressure made Tiny Broadwick the first person ever to make a planned free-fall descent. That accident she survived in mid-air demonstrated that someone who had to leave an airplane in flight did not need a line attached to the aircraft to open a parachute. A pilot could safely bail out of a damaged craft. The parachute became known as the life preserver of the air. During World War I, Tiny served as an advisor to the Army Air Corps. 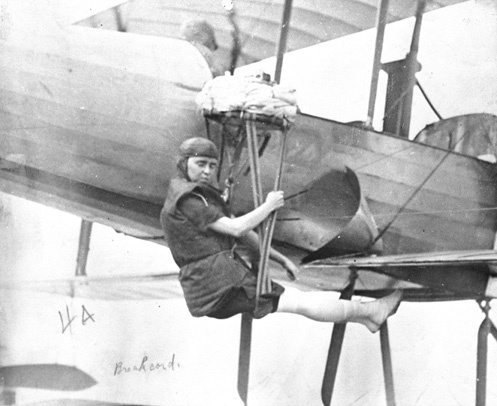 Tiny Broadwick made more than 1,000 jumps from airplanes, enduring and surviving several harrowing mishaps. Once she ended up on top of the caboose of a train that was just leaving a station; she got tangled up in the vanes of a windmill and in high-tension wires. She suffered numerous injuries along the way – broken bones, sprained ankles, wrenched back. But she loved her work. Her last jump was in 1922. Chronic problems with her ankles forced her into retirement. She eventually went to work on an assembly line in a tire factory. Later on, she worked as a companion-housekeeper for elderly people. During World War II, Tiny Broadwick visited military bases and talked to pilots and air crews. She’d bring along one or more of her primitive parachutes and convinced the lads that if she could survive a jump, so could they. 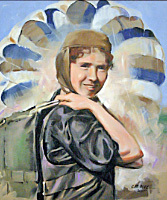 The parachute she used for her first military demonstration jump is now in the Smithsonian Institution in Washington. Tiny spent most of her life in California. In 1955, she appeared on an episode of “You Bet Your Life” with Groucho Marx. She never remarried, but daughter Verla gave her six grandchildren. Tiny also lived to see 15 great-grandchildren and several more great-great-grandchildren. She died in 1978, at age 85. She was buried in Henderson, North Carolina, the town where she first lived with Verla and worked those long days in the cotton mill. 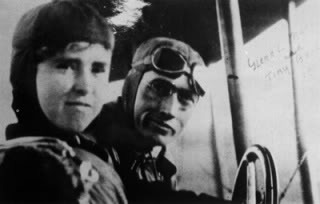 North Carolina prides itself as the state that’s “First in Flight.” Thanks in part to its daughter Georgia “Tiny” Broadwick, the little girl with the big dream and the courage to pursue it, North Carolina might also claim title as the state that was First From Flight – and safely back to earth again. Countless fliers from America who came after Tiny Broadwick would undoubtedly agree, and dip their wings in salute to her. Štefan Banič (23 November 1870 – 2 January 1941) was a Slovak inventor who devised a military parachute, the first parachute ever deployed in actual use. He patented his parachute in 1914 and donated the patent (No. 1,108,484) to the U.S. Army. Banič’s parachute became standard equipment for all U.S. aviators in World War I, and it saved many lives. Banič received no money or recognition for his invention during his lifetime. In 1997, the Stefan Banič Parachute Foundation was created to honor his legacy and memory. The foundation annually bestows the Stefan Banič Award on the world’s leading parachute-industry professionals and manufacturers, past or present. Banič was born in Neštich, Austria-Hungary, which is now part of Smolenice, Slovakia. As a young man, he was an employee of a Hungarian Count Palffy. He was fired from his job for trying to improve conditions for fellow workers and the townspeople. He was also refused enrollment to the high school because of his Slovak consciousness. Banič came to America in 1907 and settled in Greenville, Pennsylvania, where he worked in the coal mines. He later was a stone mason and an employee of the Chicago Bridge and Iron Company, where he improved productivity through his innovative ideas. Banič also attended technical school at night. He became fluent in the English language, as evidenced by his petitions for a U.S. Patent and the technical descriptions of his parachute device. Having witnessing a plane crash in 1912, Banič constructed a prototype of a parachute in 1913. The idea of a parachute had been known and discussed long before, and people had actually jumped from high places with them. 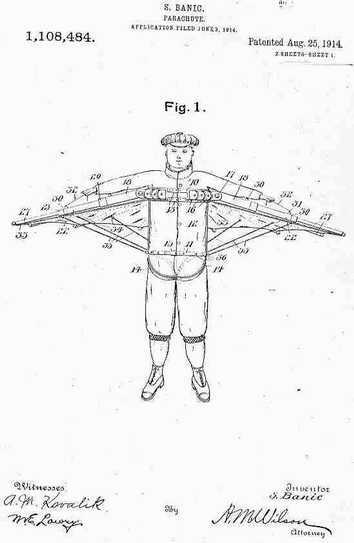 Banič’s invention was different from those we know today – it was like an umbrella that was attached to the body. Banič tested his invention in Washington, D.C. before U.S. Patent Office and military representatives. He first jumped from a 15-story building, and in 1914 he jumped from an airplane. After donating his patent rights to the newly formed Army Signal Corps and to the American Society for the Promotion of Aviation, Banič was made an honorary member of the Army Air Corps – now the Air Force – and the Society. It was a time when entrepreneurs and inventors often gained wealth and fame for their work. He received neither, even though his invention was important to war effort and to the subsequent development of modern aviation. After World War I Banič returned to Slovakia where he helped to explore the Driny karst cave in the foothills of the Little Carpathian Mountains near his home town. He died in 1941. 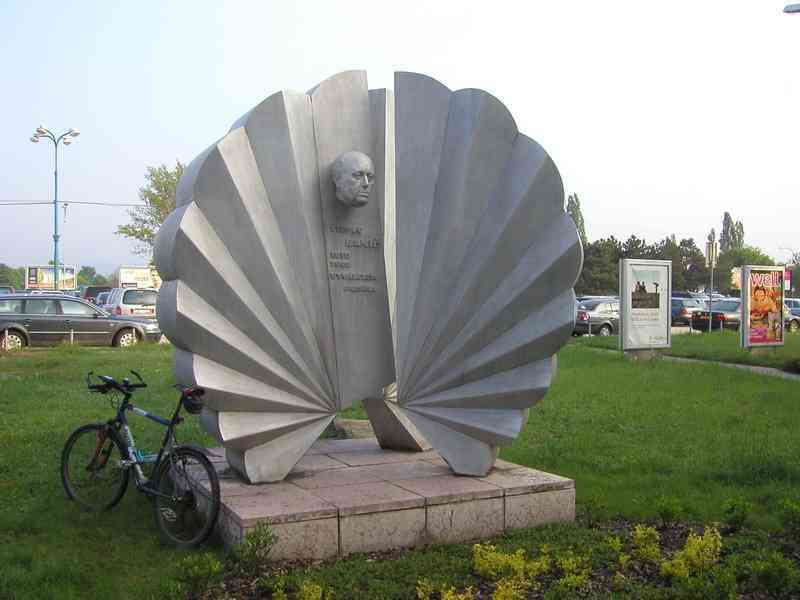 In 1970, a memorial to him was unveiled at the airport in Bratislava, capital city of Slovakia. In 1989, Banič’s first American home town, Greenville, Pennsylvania, celebrated the 75th anniversary of his invention with a gathering that included Army and Air Force officials. It was the first tribute to Stefan Banič in America. 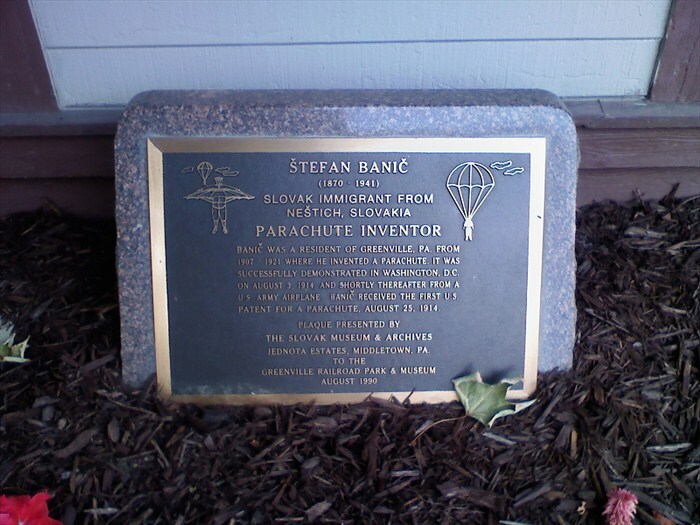 In November 1990, a bronze plaque honoring Banič was presented to the town by the Slovak Museum & Archives of Middletown, Pennsylvania. Plaque honoring Banic In Greenville, Pennsylvania. Another Slovak, Slavo Mulik, was founder of the Stefan Banič Parachute Foundation. Mulik was born in 1944 and started skydiving in 1960. He made more than 2,300 jumps and obtained American licenses as an instructor, commercial pilot and expert parachutist. He served with the 82nd Airborne and was awarded Golden Wings and Diamond Wings. She lived in Asia Minor in the third century, legend has it, the daughter of Dioscorus, a strict pagan father who locked her up in a tower to shield her from the world. She secretly converted to Christianity and wouldn’t agree to an arranged marriage. Her father had her condemned to death. She escaped several times through divine intervention, and finally Dioscorus took it upon himself to behead her. God got even with the old man, however. On his way home from killing his daughter, the father was blown to smithereens by a bolt of lightning. So Saint Barbara became the patron saint of artillerymen, armorers, military engineers, gunsmiths, miners, bomb squads, and anyone else who works with cannon and explosives. She is invoked against thunder and lightning and all accidents arising from explosions of gunpowder. She is venerated by every Catholic who faces the danger of sudden and violent death in work. Pope Paul VI removed Barbara from the calendar of saints in 1969, citing the improbability that she actually lived. No matter. Her feast day, December 4, is still celebrated in many countries of the world. 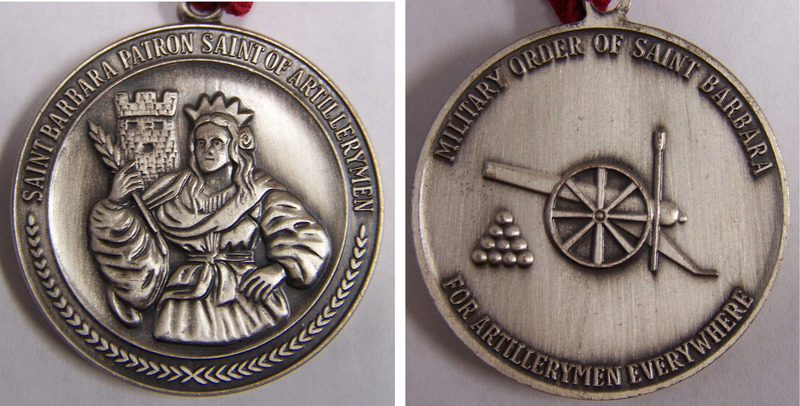 The US Army Field Artillery Association and Army Air Defense Artillery Association maintain the Order of Saint Barbara as an honorary military society. Its most distinguished level is the Ancient Order of Saint Barbara for those who have achieved long-term, exceptional service to the field artillery. Membership at that level must be approved of by the Commanding General, United States Army Fires Center of Excellence and Fort Sill. The Spanish and Italian word “santabarbara” and the obsolete French “sainte-barbe” signify the powder magazine of a ship or fortress. It was customary to have a statue of Saint Barbara at the magazine to protect the ship or fortress from suddenly exploding. She is also the patron of the Italian Navy. Who needs Barbie dolls when you’ve got Saint Barbara on your side? You are currently browsing the Veteranscribe's Blog blog archives for February, 2013.